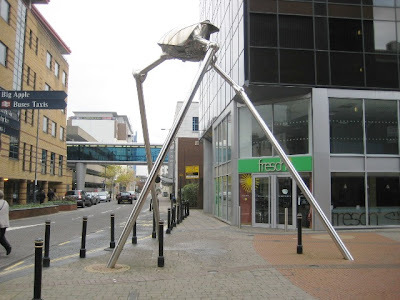 Wissy's blogspot: Woking and H. G. Wells' War of the Worlds. My home town of Woking has long been associated with H G Wells. Wells lived in Woking for several years, during which time he wrote his classic novel of alien invasion, The War of the Worlds (1898), much of which is set in and around the town. For the 1998 centenary of the publication of The War of the Worlds, the Borough Council chose to mark Woking's connection with both author and book by commissioning a sculpture representing the book's most striking image: the Martian Fighting Machine. The Martian Fighting Machine - The Tripod. 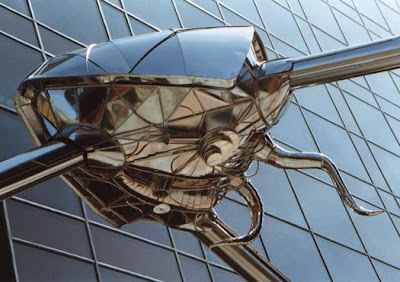 The Woking Martian sculpture was created by artist Michael Condron and unveiled in April 1998. It consists of three elements: the Martian Fighting Machine, the Martian Cylinder and the Bacteria. The Martian Fighting Machine sculpture represents one of the vast metal tripods from which the invading Martians wreaked havoc with their deadly Heat Ray. 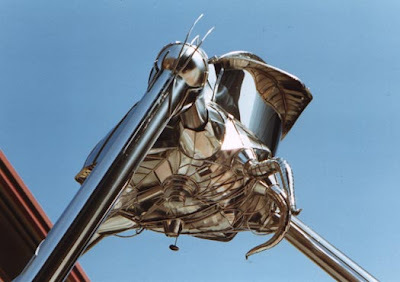 The chrome-plated stainless-steel sculpture is 7 metres (23 feet) tall with legs 17 centimetres (7 inches) in diameter. It is depicted advancing from the direction of Horsell Common, the landing site of the first Martian Cylinder. As you can see, the detail on the underside of the tripod is amazing. The underside of the Martian Fighting Machine. The Martian Cylinder represents the first of the projectiles that carried the Martians to Earth, landing on Horsell Common which is just outside Woking town centre. 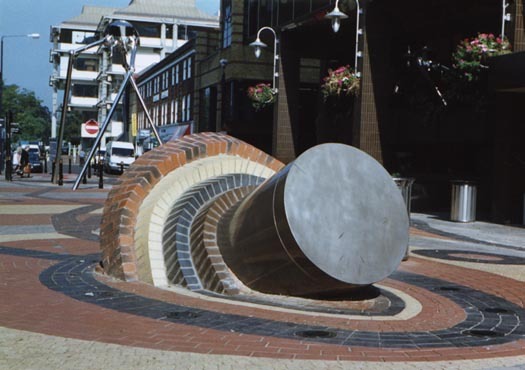 The cylinder element of the Woking Martian depicts the cylinder embedded in the Common, with multi-coloured bricks representing layers of soil thrown up by the impact. In The War of the Worlds the Earth's bacteria proved the downfall of the Martians. The concourse between the FIghting Machine and the Cylinder features a number of inlaid mosaics depicting the bacteria. The final one, fittingly, shows a microbe slithering up a leg of the Fighting Machine. I think overall that this is a superb sculpture telling in detail the story of the Martian landings. However, i'm sure that many people who have never read the book or seen the film (not the Tom Cruise Hollywood version) walk by and have no idea what they are seeing. Anyway, if you have cause to visit Woking and come across this, you now know the story behind the sculpture. I've always loved that tripod sculpture. It's just a shame it's not a bit taller and more imposing. Very cool pictures. War of the Worlds was the second book I read as a child. I just finished reading Modern Marvels - Viktoriana where H. G. Wells is one of the main characters. Highly recommended and entertaining.